Blog Girl asked Joe Jonas 5 random questions. Do you have quirky habit? I always shut our closet door before I go to bed. I don't know why, and our door. I don't know why. I just shut them. Maybe there's like something weird, everybody's got their thing to do. That's kind of my thing, you know? Do you have a favorite food? 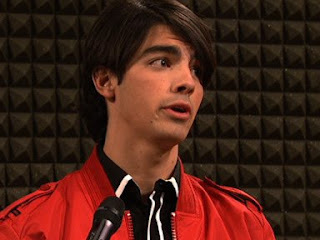 Joe: I love my grandma's homemade pizza. First of all, you've gotta say your grandma's pizza is better than any pizza in the world. But it is the best because, she's Italian. It goes over well. a studio and the second time we actually went. Besides the moon, I would have to say.. you know what? I'm going to stick with the moon because no reader will absolutely believe me but it will also be hilarious so.. come on. Walking in my backyard to the moon. What is the weirdest rumor you've ever read about yourself? That I like girls that wear chocolate chip lip-gloss. If you could have any super power, what would it be and why? I would be able to go anywhere at any time. All I would have to do is close my eyes and I'm at the place. I could be like, sitting down on the couch and be like, 'I really want a Slurpee' and bam! I'm in 7-11 getting a Slurpee and then back to my room. That'd be sweet.